Lulu Bett and her mother live with her sister, Ina, and brother-in-law, Dwight, and their two daughters - Diana, an older teenager, and a younger daughter, Monona, the typical pesky adolescent. Lulu is the housekeeper, cook and all-around "drudge" for the household and, although a relative, is treated with no more compassion than hired help and possibly with more disdain. Her domineering brother-in-law apparently takes great pleasure in cruel teasing, even his own children. His teasing toward Lulu is a constant reminder that she is not attractive and has no suitors. One day Dwight's world-traveling brother, Ninian, comes along after 20 years absence and falls for Lulu. Basically as an "I'll show you" reaction to her brother-in-law's teasing, she agrees to Ninian's marriage proposal. Later, however, he reveals that his wife left him 15 years ago, and he is not sure if she is alive or not. Lulu decides to go back home rather than risk living with a bigamist. This only intensifies the difficult situation at home as she has now embarrassed the family, a fact Dwight wants to keep quiet. The handsome schoolteacher, Neil Cornish, begins to show an interest in her, but Dwight does not approve - after all, Lulu may still be married. Lulu tells Neil about her marriage and the dilemma of not knowing if she's legally married or not. This does not dissuade him, and he continues to see Lulu. Diana is just as dissatisfied with the home as Lulu and decides to elope with Bobby Larkin. When Lulu learns of this, she goes to the train station and convinces Diana to come home. She promises not to tell Diwght and Ina. At home Diana has gone to her room, when Dwight and Ina come in and see Lulu wearing her hat and holding Diana's suitcase. They immediately assume she is running away with Neil and begin to berate her for trying to further disgrace the family. Dwight orders her to leave. Lulu's life seems to be crashing down all around her - she doesn't know if she's legally married or not, she can't return Neil's love for her, and she has no home or means of income. "Miss Lulu Bett" represents a transition that was taking place with women during the early twenties. It portrays a family still ingrained in Victorian values, yet to escape her life of drudgery and verbal abuse, Lulu must assert her independence - an assertiveness that was becoming more representative of the woman of the twenties with each passing year following World War I. It's easy to see the appeal the film had in its day. It's true-to-life depiction of small town Americana and the 1921 mores were familiar to the movie-going public. The film contained personally identifiable situations and conventions and, considering its success, obviously "connected" with the movie patrons of the day. William de Mille, Cecil's older brother, displays a sensitive touch that brings out the emotion of the Zona Gale novel and provides more than a situational dilemma to hold the viewer's interest. Instead, he delves much deeper into the psychological make-up of a somewhat dysfunctional family for a more satisfying and memorable viewing experience. According to Kevin Brownlow in The Parade's Gone By (Bonanza Books, 1968), "'Miss Lulu Bett' shows de Mille to have been a man of great warmth and perceptiveness. He cared more for psychological reality than melodramatic action, and his style was as different from Cecil's (DeMille) as a miniaturist's from an epic painter. This brilliantly directed film tells the story of a young woman, a spinster, considered unattractive, who works as a household drudge for her sister's family. . . The sense of observation reached a standard very seldom excelled, and de Mille's compassion and his realistic treatment give every scene a truthfulness still are in cinema. It retains its magic, and this fragile, delicate little story can still move its audience to tears." The opening title gives an apt description of Lulu's life. "The greatest tragedy in the world, because it is the most frequent, is that of a human soul caught in the toils of the commonplace. This happens in many a home where family ties, which could be bonds of love, have become iron fetters of dependence." Dwight Deacon is ably portrayed by Theodore Roberts, the venerable old actor who could move from comedy to drama with ease. He's still his same old cigar-chewing curmudgeon, but not likely to be described as "lovable" in this film as he had been in previous ones such as the Wallace Reid comedies "The Roaring Road" (1919) and "Excuse My Dust (1920). In "Miss Lulu Bett," he's domineering, demands that the whole family serve and cater to him, is cruel with his words, has alienated his children, and treats both his mother-in-law and sister-in-law with disdain. 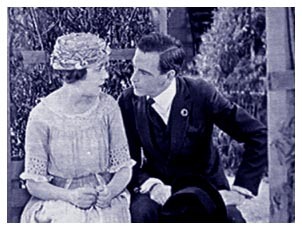 His attitude toward Lulu is revealed early on in the film when he notices a small flower in a pot and asks if it came from a suitor. She explains that it was only a quarter, so she purchased it herself. He disapproves of even this small pleasure she has allowed herself and attempts to make her feel guilty for this indulgence. "Yet I give you a home because you have no money to spend even for necessities," he chides. 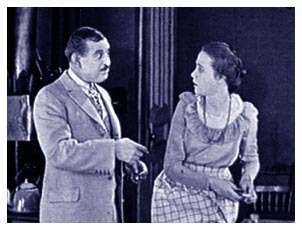 In this one simple scene, de Mille has provided a situation that speaks volumes about the psychological aspect of Lulu's relationship with her brother-in-law. Notice that Dwight's first concern was the presence of a suitor. He is obviously very concerned with losing a cook and maid rather than being happy that she may have a beau in her life. He belittles her for her inability to support herself and reaffirms her dependence on him for survival. In addition, he portrays himself as a great humanitarian for giving her a home - for which she should exhibit more gratefulness than "wasting" a quarter on flowers. It is no wonder that Lulu is flattered by Ninian's (Dwight's brother) attentions when he comes to town. Shortly after arriving, all the neighbors are invited over to hear him talk about his travels and see the many curios he has accumulated during his excursions. He goes into the kitchen and asks Lulu why she isn't in the parlor with the rest of the family. "You're the first person who ever noticed I wasn't there," she says. He escorts her into the parlor and seats her in a chair before continuing with his talk. In spite of the obviously fantastic stories being told by Ninian (such as a re-enactment of how he fought off a lion attack), Lulu is mesmerized. She is even more enamored when he offers to take her to dinner in the city. Dwight and Ina accompany them to the restaurant, and, as a joke, Ninian takes a cigar band and slips it on her finger saying that he takes her to be his wedded wife. Lulu is embarrassed, but Dwight's teasing that she doesn't have the nerve to respond prods her to do so. Suddenly, Dwight remembers that he is a justice of the peace, so the exchange of vows in his presence makes the marriage legal. Ninian convinces her to "let it stand." A week into the marriage, Lulu is very happy with how well Ninian has treated her and tells him, "You're so good to me. I know I'll learn to love you," indicating very clearly to the viewer that she did not marry for love. However, a discussion follows that reveals Ninian was married 15 years ago, and his wife left him. Since he does not know if she's alive or not, he could still be married. Although Lulu dreads the thought of going back to Dwight and Ina's home, she cannot stay and live with the fear she is living with a man and not legally married to him. Several emotions come to play at this point in the film. We are happy that Lulu has been rescued from her life of drudgery, but we also know she is not in love with this man. A relatively unknown actor (although he had over 130 films to his credit between 1913 and 1932), Clarence Burton is perfectly cast at Ninian. He is small in stature, slightly pudgy and far from the leading man type - yet although his appearance is less than we would want for our heroine, he has treated her well, and, therefore, we find it impossible to dislike him. 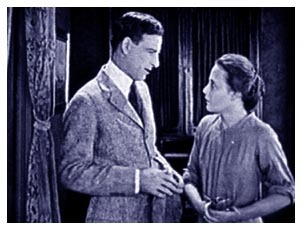 The viewer's obvious pick is schoolteacher Neil Cornish (played by the handsome Milton Sills), but now it seems circumstances are preventing her from a relationship with him. de Mille adds a nice touch to this sad scene as Lulu reluctantly leaves her life of contentment and simple pleasures to return to the drudgery of the Deacon household. Lulu looks down at a beautiful dress slipper that now belongs to her. Her vision of this slipper slowly dissolves into an old, worn, oversized bedroom shoe that we saw her wearing earlier in the film - a very appropriate metaphor for the life she is now living and the life to which she is returning. 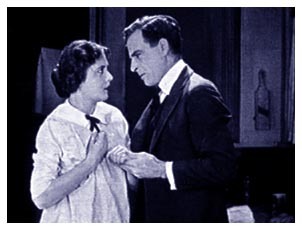 Author Jerry Vermilye in Films of the Twenties (Citadel Press, 1985), notes, "The movie also represented an ideal collaboration of director and star, for Lois Wilson, contemporary sources concurred, could hardly have submerged herself more completely in the title character had it been her own personal story. Decades later, asked about her favorite picture, a long-retired Wilson - with a salute to 1923's more renowned 'The Covered Wagon' - nevertheless named 'Miss Lulu Bett' as her choice, explaining, 'It was a character part, and I loved every moment of it. Mr. William de Mile was a great director.'" Lois Wilson truly does a remarkable job with the role of Lulu Bett, neither overacting the drudge role nor using extreme gestures or expressions to gain sympathy from the audience. Her acting is subtle and graceful, very natural and believable, yet exhibiting the necessary pathos of the beleaguered domestic. She nearly elicits a "hurrah" from the viewer toward the end of the film when she finally defies Dwight. After a misunderstanding in which Dwight thinks she is running away with the schoolteacher - which would disgrace the family further - he orders her to leave the home. Lulu goes into the kitchen, and, when Dwight has calmed down, his wife reminds him that there will be no one to cook and clean if Lulu leaves. He has second thoughts and goes to the kitchen to tell Lulu he has forgiven her. In a first-rate display of acting, Wilson initially gives a hysterical laugh through her tears, then shouts, "Yes, I know why you'll forgive me. Because of this - " pointing to the stove. She begins throwing pots and pans around the kitchen, breaking dishes and essentially wreaking havoc. While Ina and the mother look on in horror, Dwight attempts to stop her, but she tears herself loose and shoves him away asserting, "You can't forgive me!" before rushing out in tears - a very powerful performance. "Lois Wilson's performance never fails to reflect truth, or move her audience, as she grows from the self-effacing domestic to full realization of independence as a woman of character and beauty." Vermilye said. "But de Mille's subtle direction keeps the movie's characters as believable as his American small-town milieu is recognizable. His attention to everyday detail is meticulous, and his observation of human foibles uncanny. 'Miss Lulu Bett' represents a quiet milestone of naturalistic quality in the films of the early Twenties." Wilson had appeared in over 90 films from 1915 until the making of "Miss Lulu Bett," in 1921, but the early twenties proved to be only the beginning of her greatest fame with 1923's "The Covered Wagon" standing out as her most popular role. Although she continued to be very popular and in great demand throughout the silent era - including such films as "Monsieur Beaucaire" (1924) with Rudolph Valentino and "The Great Gatsby" (1926) - other than "The Covered Wagon," she never was given the "great" film or the "great" role. Continuing to be very active beyond the silent era, she appeared in nearly 150 films between 1915 and 1949 and then continued with TV roles through the mid-fifties, including a couple of soap operas. Milton Sills was one of the most popular leading men of the silent era with over 80 films to his credit between 1913 and 1930. One of his most memorable films, Rafael Sabatini's "The Sea Hawk" (1924), was indicative of the type of role in which he was most often cast - the strong hero who saved the day. He was only 48 when he died suddenly from a heart attack while playing tennis in 1930. His character in "Miss Lulu Bett" is a rather shallow role that essentially fills a need in the story - that of the handsome suitor with whom she is in love and who provides an escape from her miserable life - but, other than that, he has no impact on the storyline. He is a necessary element, but does not actively influence the course of events in anyone's life. The cinematography of "Miss Lulu Bett" is excellent, and, in spite of being adapted from a novel turned stage play, there is no "staginess" about the film - even though outdoor scenes are limited to the front yard and a scene outside the church after Sunday morning services. Also, the story is presented in a compact manner without extraneous scenes or "bits" and moves along at an interest-holding pace. The 71-minute running time is entirely appropriate for the film. Although it received overall positive reviews, one reviewer noted that someone younger than Theodore Roberts should have been cast in the role of Dwight Deacon, and someone older should have portrayed Lulu's and Ina's mother rather than Ethel Wales. As good as Roberts is in any role, the reviewer's comments are justifiable for both him and Wales. "Brims over with human interest, pathos . . ."
Of the film, Variety (December 23, 1921) said, ". . .Famous Players has turned out a first-rate, non-sensational, program feature. . . Judging 'Miss Lulu Bett,' therefore, as an original scenario, it is a well-wrought, closely-knit, straightaway, cumulative domestic drama of rural life, well acted throughout, carefully produced and vividly atmospheric. . . Lois Wilson in the name part is as nearly perfection as one could imagine. She brings to the role just the requisite pathos." The reviewer for Harrison's Reports (December 24, 1921) said, "'Miss Lulu Bett' fairly brims over with human interest, pathos, and the hard-to-duplicate comedy touches of Theodore Roberts. 'Miss Lulu Bett' affords excellent entertainment of the wholesome sort that every member of the family can enjoy. The acting and the directing are 'up to snuff' every minute; and the inimitable Theodore Roberts outdoes himself, if possible, in this picture."